Soon I hope, digital cartographers will add a layer on GPS maps to show ecological regions much as they do terrain now. Updated research that came out while we were on the road found that 90% of map use now is on a smartphone or tablet with nearly 6-in-10 Americans tapping into GPS on smartphones each month and more than a quarter doing so on a tablet. Nearly half now use the devices to access visitor guides. Americans on vacation are now 2.5 times more likely to use GPS over a paper map or printed directions. Now that my CoPilot GPS app isn’t reliant on cell coverage, I probably won’t order GPS in my next Jeep, although it is cool to look over at any time and see the posted speed limit. Use of built-in-vehicle GPS is now below 17% and most of those are people my age or older and in the Northeast. Within three years, smartphones will be used by 84% of Americans while tablets will increase to 71%. Digital maps today are layers of data using GPS. When a user runs into inaccurate directions it is most likely because the jurisdiction isn’t updating impedance data or new routes. Or platforms such as Navtech or Mapquest or Google update at their end only periodically. One of the roles of destination marketing organizations is to monitor both ends of that process and spur constant updating. Many people only think of historic buildings when they think of sense-of-place but place based assets also include distinctive culture/history and natural/environment. At its coarsest level, North America has 15 ecoregions. Zoom in a level and you see 52. At level III, the USA has 104. Zoom into the state level and a state such as North Carolina has 29 different areas of distinct geology, physiography, vegetation, climate, soils, land use, wildlife and hydrology. Durham, where I still live in retirement, has a very distinct cultural identity and different sense of place than Raleigh, a metro center further south and east with which we co-own an airport, but I didn’t realize that is also true of Fort Worth and Dallas, which are also often lumped together because they co-own an airport. Fort Worth is in a unique part of an ecoregion called the Cross Timbers, while Dallas is in the Blackland Prairie that stretches down to San Antonio. Cross Timbers is a “complex mosaic of upland deciduous forest (shorter but post and blackjack oaks with striking habits,) savanna, and prairie” that stretches from north of Austin up past Fort Worth and through central Oklahoma into Kansas. It is the western most extension of the eastern oak-hickory forests covering nearly 20 million acres at one time and possibly the least disturbed. 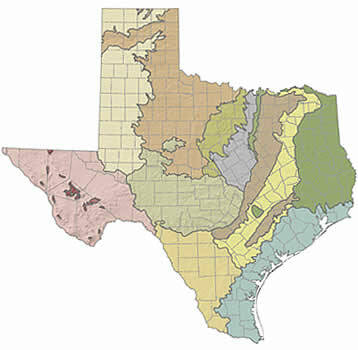 When Texas became a state, there was a provision to divide it into five different states but it has an incredible 56 different ecoregions. It is a much more diverse state than often depicted. I have a general idea in advance of the routes we will take on each cross-country but Mugs and I don’t zero in on the route we will take each day until we punch it into GPS and take a fresh look at ecoregions along the way. Our route up through Henrietta and Wichita Falls took us up along US 287 through four beautiful ecoregions of Texas. Amarillo, where we turned west toward the Southern Rockies of northern New Mexico is High Plains, similar to Denver, Fort Collins and Cheyenne. Overall, we took five unexpected routes during this trip. More on that later.